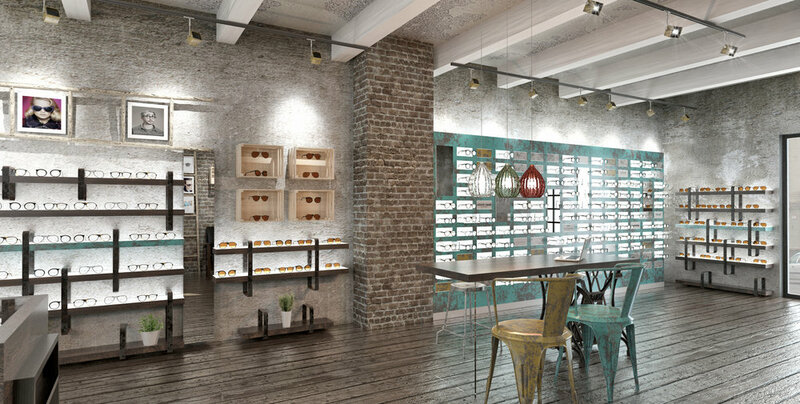 The open space with sectionized display areas invites to browse through and to explore the eyewear collections. Individual showcases and pods for assorted collections with see through room dividers for the Exam and Testing area. An inviting cozy optical with artsy accents. The decorative art throughout the office enhances the ambiance while sleek shelving highlights the displayed frames. Continuous organic shapes create a cohesive space. Edgy accents, eye-catching forms and simple oriented strand board complement the black and white polished space. LED lights are highlighting the very distinctive reception desk. 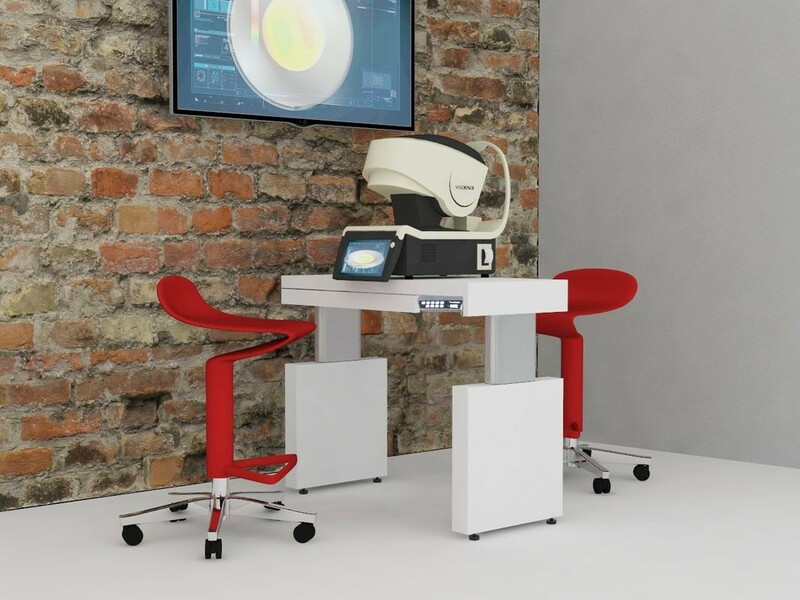 An exposed Lab with Optical Bar and a displayed testing area enhance the loft space atmosphere. 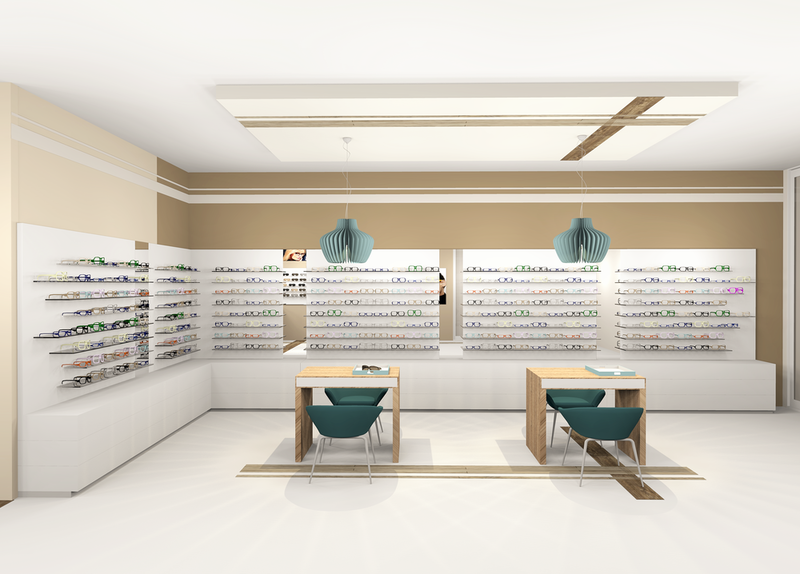 Corporate color accents follow through the entire Optical, the clean display surfaces and the sleek LED shelving accentuate the displayed eyewear. 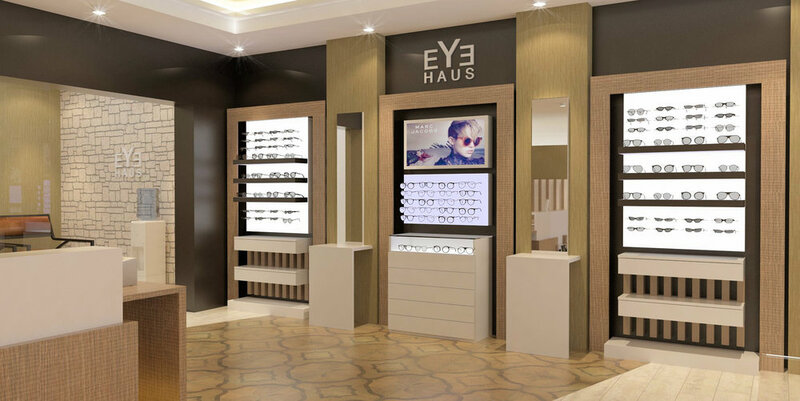 The center lounge invites to explore the entire optical boutique while waiting. 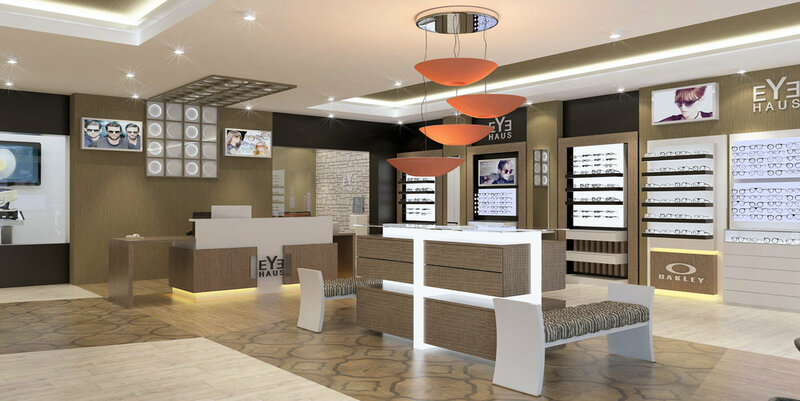 Implemented circle accents in the displays, lighting and artwork complement the curved reception desk and walls. Individual display units to sectionize the frame presentation. 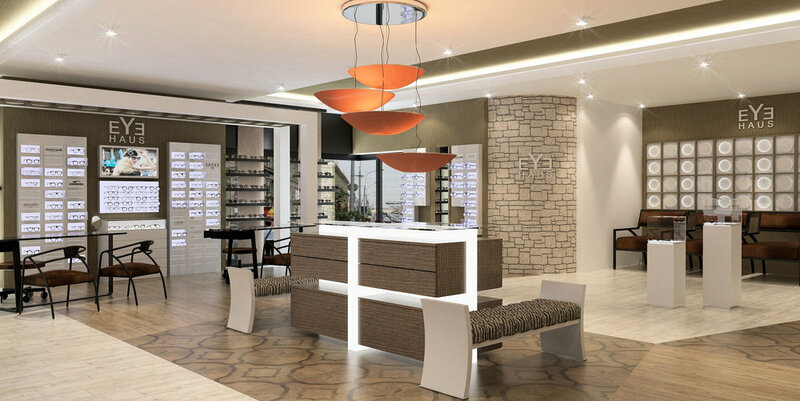 A center focal point with an LED showcase, accent lighting and waiting benches. 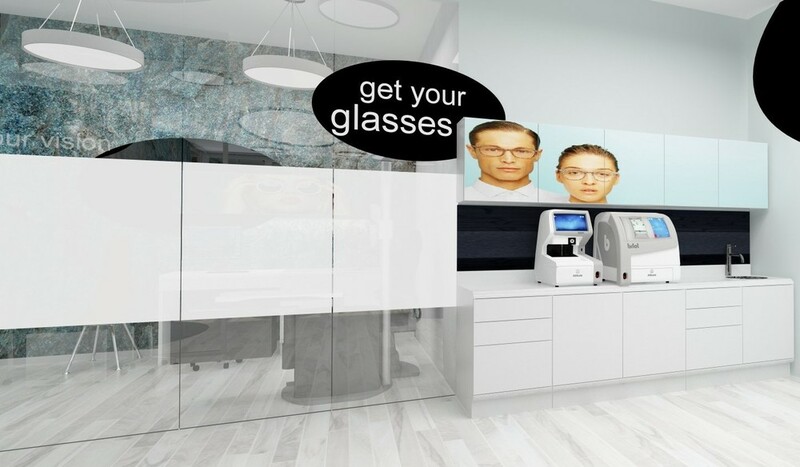 An open space with a center waiting area allows a natural patient flow and the animation to look around while waiting. 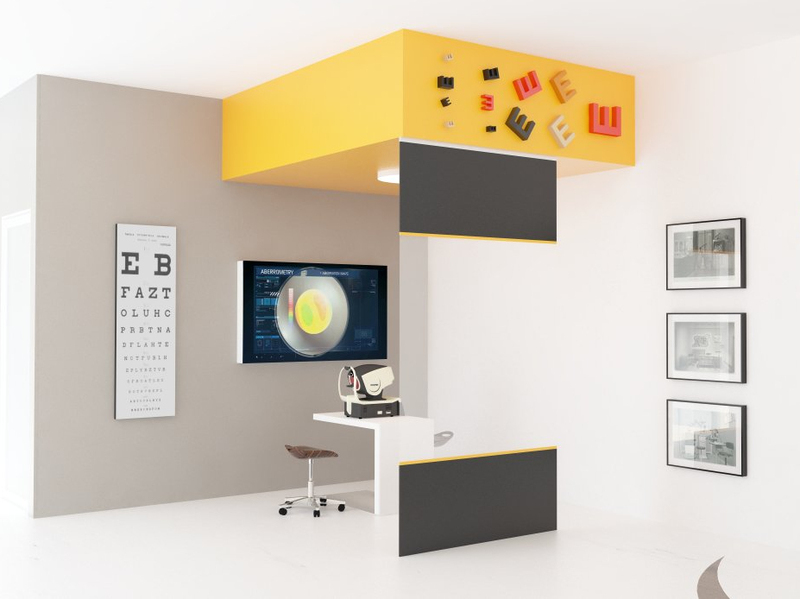 The build in display wall with magnetic setup gives flexibility in (re)designing the wall and change capacity based on the currently displayed collections. 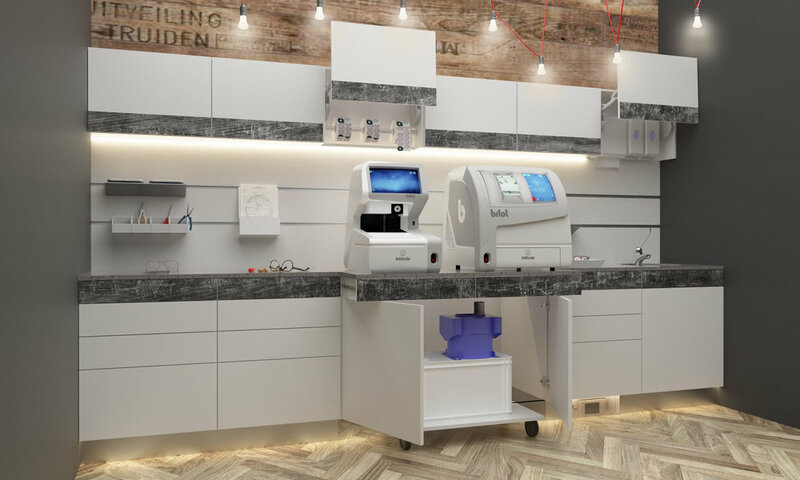 An exposed testing area within the dispensary displays the high tech equipment. Individual display walls are designed by highlighting various frame collections. A clean and sleek interior but yet warm. Different forms and shapes for an individual interior with a clean LED frame presentation. 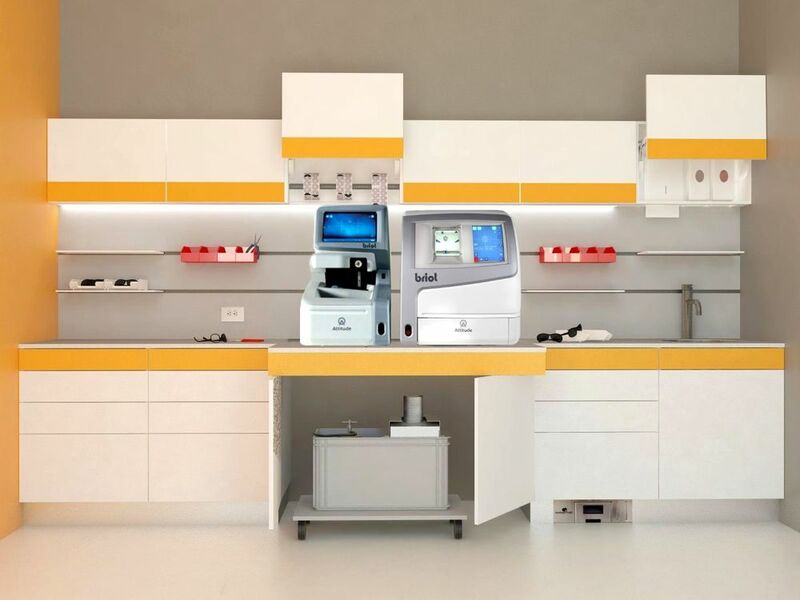 A modern dispensary with a large common dispensing table. LED shelves are highlighting the frame presentation in an avantgardistic interior. An industrial chic interior with reclaimed wood cabinetry and steel showcase tables. An exposed LAB with open work bench represents the specialty and work around a frame. Exposed and displayed testing instruments integrated in the open space. A traditional color scheme in a modern combination of built-in displays with shadow free lighting. White pure minimalist displays with warm and natural stone and wood accents. A strong accent color and pattern as well as alternating display heights create a fun and eye catching environment. An open friendly space with an exposed LAB, exposed Pre Test area that can be blocked of during the testing and an integrated Lens presentation and education. 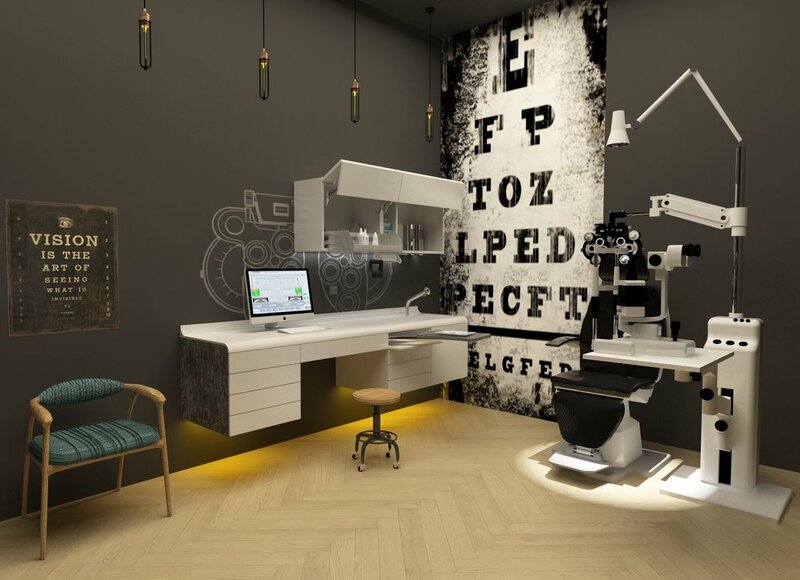 A vivid interior with a clear patient flow and exposed Lab with an Optical Bar. A high-end interior in a combination of wood and stone in furniture, displays, wall cover and flooring. 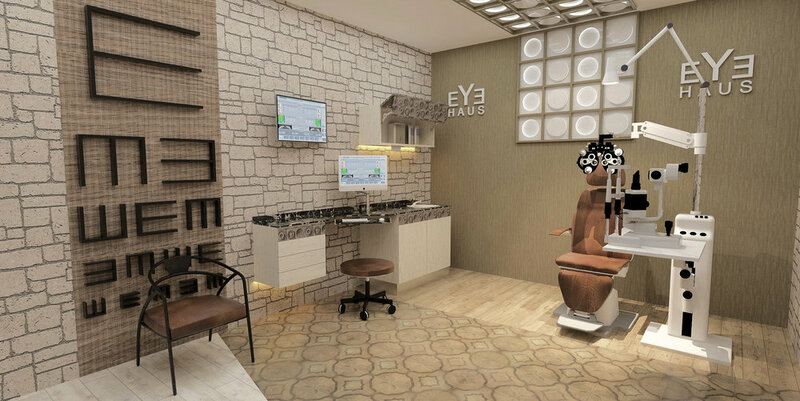 An office with transparency in all fields of an Eyecare Professional. 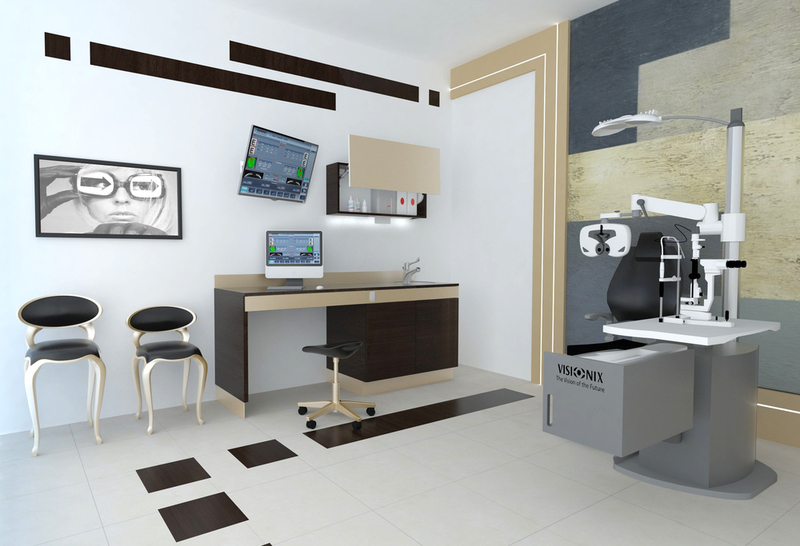 The exposed Testing Area, Exam Room and Lab present the full scope and value of the practice. 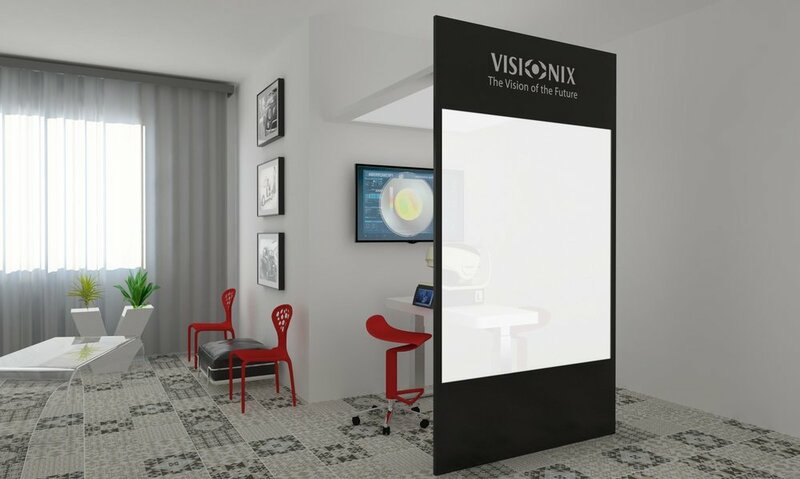 Remote controlled privacy panels block the view while being with a patient. A classic and sleek interior with minimalistic accents and continuous design elements. 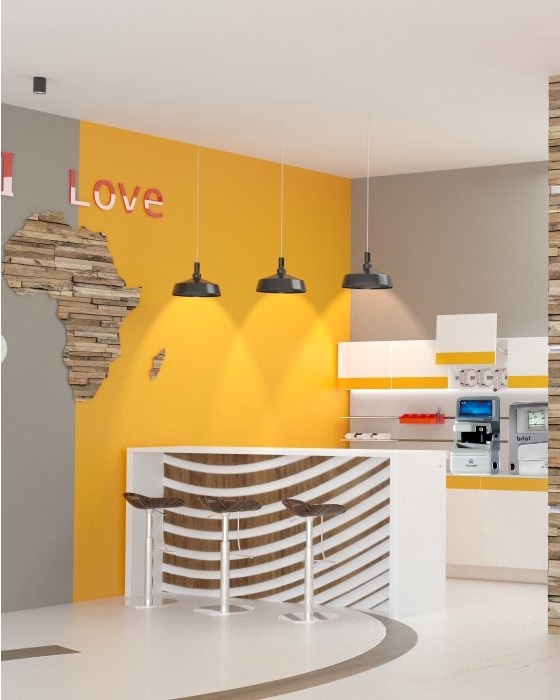 Emphasize the individual character of the space by using themed features with your Displays. An inviting open space that animates to browse through and provides full transparency in offerings and work. A contemporary dynamic interior with a clean frame presentation. The open space ties in also the Lab and Testing Area into the Optical. 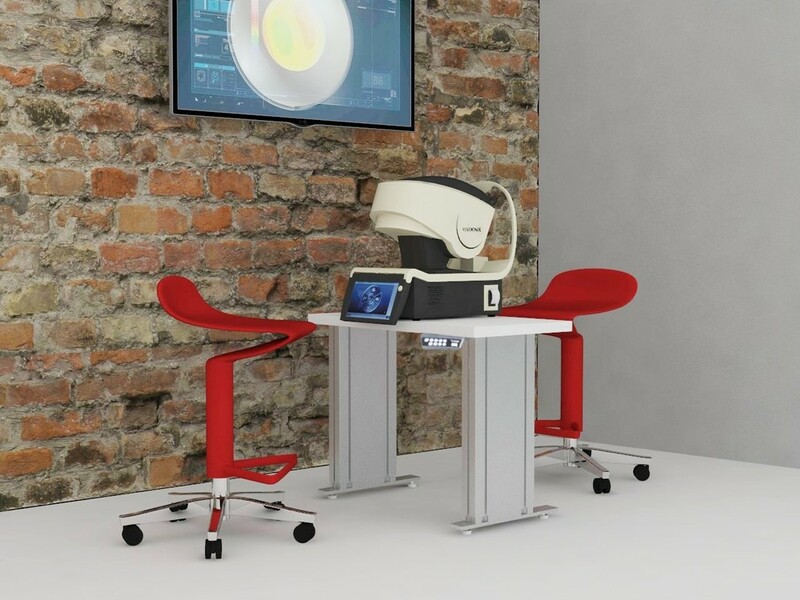 Exposing your High Tech Equipment and a transparent step-by-step approach towards the patients shows confidence and competence. A classic and sleek interior with minimalist accents. 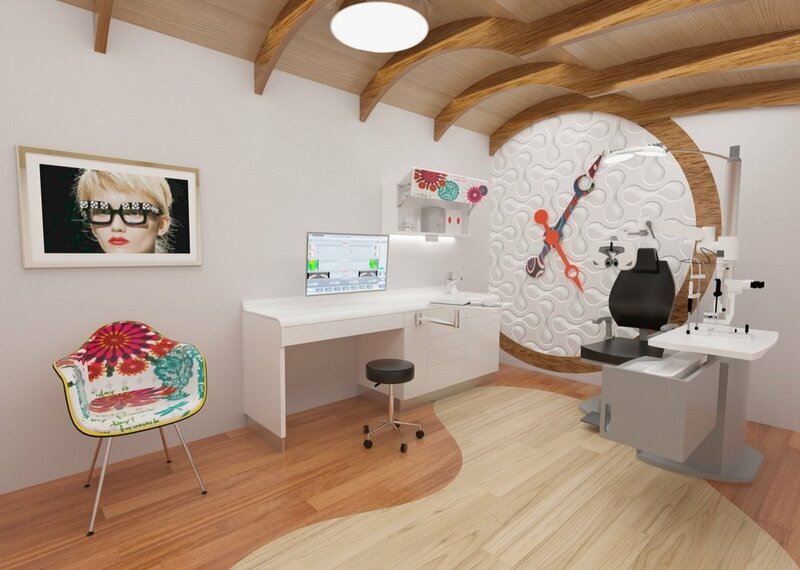 The structured space keeps the patient flow organized in a natural manner. An immediate overview on the scope gives the patient a clear understanding. A clean and organized Set Up. 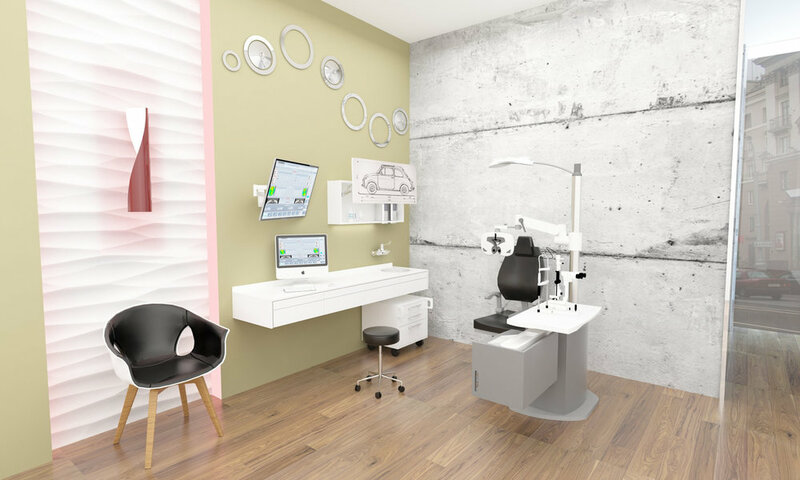 Hidden aspects as well as the attention to detail are emphasizing a medical environment and highest comfort for you and your patient. 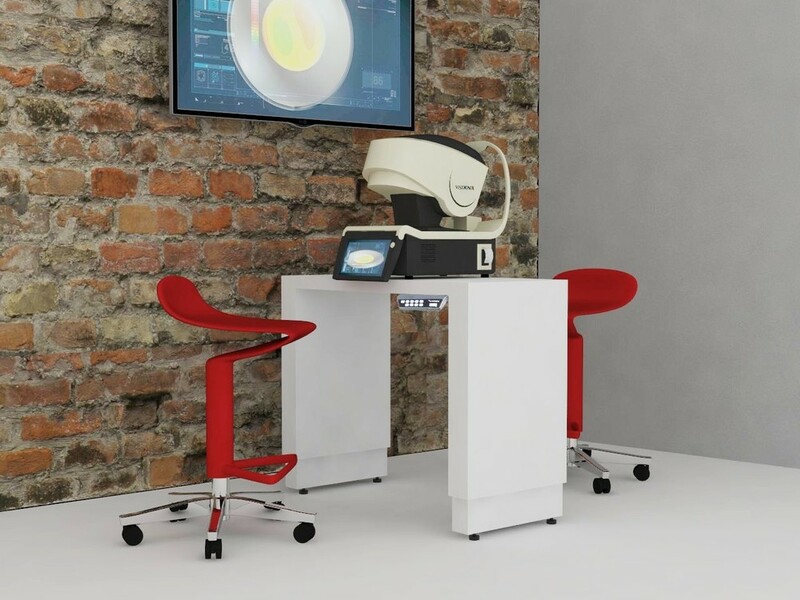 As part of a modern Optometry office show patients the extend of your equipment and instruments, enhancing your proficiency. A remote controlled panel ensures privacy during the Testing. 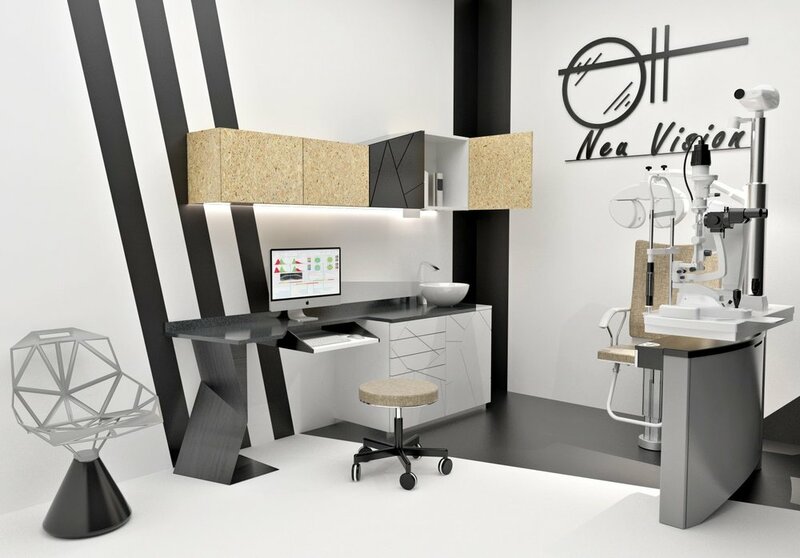 An Optical Bar in combination with an exposed Lab for a better understanding and appreciation of your work. The new Briot Attitude Edger with minimal noise allows an open Lab concept due to its quite processing. A well structured Set Up with amenities such as a Pull Out counter top for an easy service on the machines as well as integrated features in the cabinet, keep the area clean and are showing an efficient and professional work.